Airbus thinks the future of air travel is pretty clear — literally. 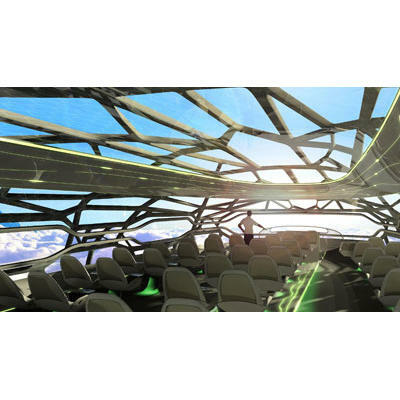 The company recently shared its take on what airplanes will look like by 2050, and the concept included a cabin with a clear ceiling and walls! If you’re suddenly reminded of Wonder Woman and her transparent jet, you’re not far off. The plane, which also features special body-molded seats, will afford every passenger a stunning panoramic view of the skies, as the cabin displays augmented reality data on its clear panels as certain landmarks go by. But the techiest of travelers might be most interested in the “interactive zone.” To kill time on that 13-hour flight to Melbourne, passengers will be able to partake in virtual reality–like pastimes, from gaming to shopping (complete with virtual fitting rooms) or even interactive conferences. Sounds pretty utopic, doesn’t it? It’s basically the extreme opposite of the cattle-like experience we suffer through today. But is it really feasibly for air travel to advance that much in the next 40 years? Frankly, I’m dubious. The airline industry seems to have devolved over the last decade or two, not advanced. At this rate, we’ll all be sling-shotted across the pond with a helmet, kneepads and a bag of peanuts (which they’d probably charge us for). Even if you strip away all the amenities, the nuts and bolts of this concept are still mind-boggling. Wacky see-through, transparent hulls? Sure, it may seem like a good idea now — but just wait until they have to peel scores of doped-up aviophobics out of those chairs en masse. And will Grandpa be able to withstand such a trippy, freaky ride without having a heart attack? That remains to be seen. What do you think? Are transparent planes on the horizon? And would you fly in one? Weigh in.